Active Co-Q10 Ubiquinol, 60 ct. - MDR Fitness Corp.
Do You Need to Take Co-Q10? Are you over the age of 40? As we age we produce less Co-Q10, and we become less able to convert common Co-Q10 to the active ready-to-use form. With certain health conditions levels can decrease more. Ironically, Statin drugs which are prescribed to lower cholesterol, also lower Co-Q10 levels in the body. If you are taking Statins, you need to take Co-Q10 to replenish what you lose each day. It also helps protect against LDL (bad cholesterol) oxidative damage. Do You Want to Support Brain Health? Your brain needs lots of energy too, and it also requires Co-Q10. In addition, Co-Q10 is an antioxidant that protects brain cells from oxidative stress. Think about it... 24 hours a day your heartbeat relies on a constant flow of energy created in the 5,000 mitochondria power plants found in each cell of heart muscle. If you want to support heart health, take Ubiquinol each day. Co-Q10 is most concentrated in parts of the body that need the most energy, like your brain, heart and kidneys. Co-Q10 helps convert food into energy to keep the heart efficiently pumping blood through the body and the kidneys functioning well. Do you want to maintain youthful vitality? 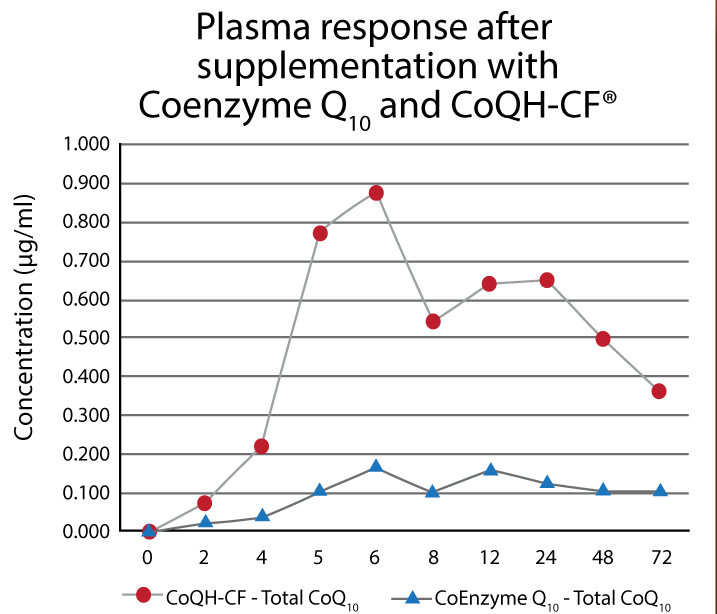 Co-Q10 has been shown to protect against oxidative stress which is related to aging and a wide range of disorders. Studies show Co-Q10 helps support MSC (mesencymal stem cells) and mitochondrial function essential for repair, renewal and energy. Less than 1% of Co-Q10 is absorbed in the GI tract to the blood. If you don't take foods containing fat with your Co-Q10, absorption is decreased. • #1 ubiquinol (in MDR Active Co-Q10) is ready and easier for the body to use. • #2 ubiquinone (the oxidized form) used in many other Co-Q10 supplements, which your body must convert to the active form. • inside cells - these electrons work in the mitochondria powerhouse, to help produce ATP, for energy. • outside cells - these electrons help to neutralize free radicals providing antioxidant protection. MDR selects the finest sources of ingredients using Kaneka Co-QH-CF, as the source of Active Co-Q10 Ubiquinol. The formula also contains protective antioxidants Alpha-Lipoic Acid, and d-Limonene, derived from cold pressed Orange Oil, with Capric/Caprylic Acid. Together these ingredients solubilize and stabilize the fragile Co-Q10. Using 200x microscopic examination, scientists proved the Active Co-Q10 is totally dissolved with no remnant crystals. This superior solubility means its easier for your body to absorb and benefit from the Active Co-Q10. Energize and protect your health today with MDR Active CoQ10! the 100 mg is great, no need to take anymore, so easy to swallow !!! Very good!!! Makes me feel so much better. Cant thank you enough!! Wonderful!!! Feeling so good since I have taking this!! So happy!! Like this product from MDR much better than others in the store. I desperately needed energy, so my neighbor told me to order this. Very satisfied and feel like I have much more energy! Im a vegetarian and felt very unhealthy. My doctor said I needed Co-Q10, but I had no way of getting it since I dont eat red meat or liver. A family member recommended these, so I decided to try them out. I feel very healthy and my body just feels amazing! I am a heart patient and COQ10 made all the difference in my energy level! MDR COQ10 are easy to swallow and I take them along with my Fitness Tabs. My Doctor told me to take Co Q 10 to support my heart health and that the form offered by MDR was better than typical CoQ10 sold in stores. I believe it. I have taken it or a month and feel 100% better. I just seem to go go all day and best of all I know I am helping my heart stay healthy.